Last month I shared with you my current skincare routine in my "CRUELTY-FREE SKINCARE FAVOURITES". Moving away from skincare, I thought I'd next share with you my hair care favorites and the products I love to use. For a while, I have been loving using my Lush Jumping Juniper Shampoo Bar. While an exclusive to the Lush Oxford Street store, you can still pick this up online here. I find I have quite oily hair and this really has helped rein the oil in and giving my squeaky clean hair. It's also great for helping any dryness on my scalp as well as help sooth. The shampoo bars are definitely worth the money as I've found them to last a long period of time. I've also picked up the Jason and The Argan Shampoo Bar for my birthday. If you're looking for a shampoo bar to soften hair and restore shine maybe check this one out. I'm yet to give it ago but will report back when I do. 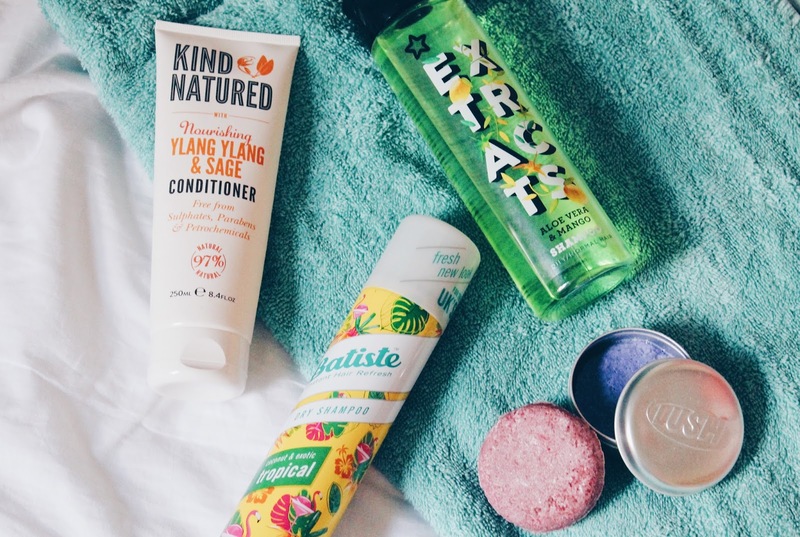 If you're looking for cheap cruelty-free products, Superdrug is the go to and when looking for an alternative shampoo I found Superdrug's Extracts Aloe Vera and Mango Shampoo for oily/normal hair. This reminds me of my childhood shampoo Alberto Balsam and I love it. Similar to the shampoo bar, it leaves my hair perfectly clean and helps control oil. I don't think I'll ever need another conditioner again other than the Kind Natured Nourishing Ylang Ylang & Sage Conditioner. I stumbled across this in boots and it's been a gem. I mentioned this is my JANUARY FAVOURITES but it's been great at restoring hydration to my ends due to the change in water. While the smell to some is a little funky, I think it adds the natural nature of the conditioner. It works really well and, while seem to be sold out every time I go to repurchase, I think I'll be sticking with this one for a while. Batiste is still a staple. From my research, I've found this to be cruelty-free to my happy surprise. I've not found a dry shampoo that lifts and restores my worn hair better than this. If I come back from a day of lectures and don't have the time to re-wash my hair before going out with friends, this gives it back the life that the lectures have drawn out from it. My hair care is as simple as always but it works for me. What are your current haircare staples?